Jarrod Saltalamacchia's seventh-inning grand slam, and yet another 1-2-3 inning of relief from Koji Uehara helped lift the Red Sox to an 8-4 win over the New York Yankees at Fenway Park Friday night. Boston jumped out to a 4-0 lead in the bottom of the first inning off starting pitcher Hiroki Kuroda. Dustin Pedroia led off with a single. David Ortiz followed a double to left, and Mike Carp drove in Pedroia with an RBI groundout. Daneil Nava added an RBI single, and Stephen Drew finished the scoring with a two-run double to left. The Yankees chipped away off John Lackey with solo runs in the top of the third and sixth innings, and then tied the game in the seventh on a two-RBI double by Robinson Cano. Lackey went 6.1 innings, charged with four runs on seven hits. He struck out three and didn't walk a batter. The game remained tied until the bottom of the eighth. Shane Victorino led off with a single and Ortiz was hit by a pitch. 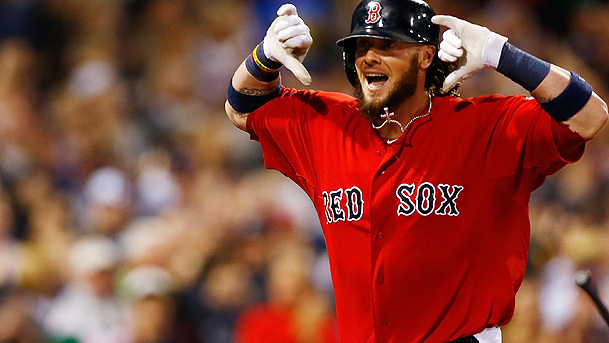 Reliever Preston Claibourne walked Jonny Gomes to load the bases and one out later Saltalamacchia (pictured) crushed an 0-1 fastball into the right field bleachers past the Red Sox bullpen for his thirteenth home run of the year and his first grand slam since 2009. Uehara pitched a perfect ninth inning and has now retired thirty seven batters in a row; his earned run average dropped to 1.06. With the win, the Red Sox became the first team in Major League Baseball to reach the ninety-win mark in 2013. Their magic number to clinch the American League East dropped to seven.